With a Liebherr Refrigerator Water Filter, you can achieve a new level of purity with your water and ice. These filters are designed to perform at the highest level and will produce refreshing, clean water and ice for up to six months. With the correct filter in your refrigerator, you can significantly reduce or even eliminate water contaminants and harmful particulates like chlorine. Over time, cumulative exposure to water contaminants can weaken your immune system, cause cellular damage or even cell mutation (cancer). 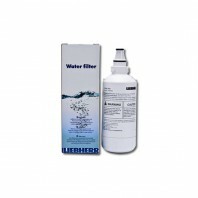 Discount Filter Store is a proud distributor of Liebherr Refrigerator Water Filters and currently carries the 7440002 Liebherr Refrigerator Water Filter, a genuine OEM filter. Why choose Discount Filter Store? Our products ship fast, install quickly and stand the test of time. If youâ€™re not sure which filter you need, contact us or call 1-800-277-3458 for assistance. In addition to refrigerator filters, we also carry undersink filters, faucet filters, coffee filters and more.